Device mounting adapter, Male piece. AMPS-standard holes. Use with item 215053, 215054 or 215055. Device mounting adapter, male piece. Is to be used with item 215053, 215054 or 215055. With this extra male piece you easily move your device between vehicles, for example. The pictures show the device mounting adapter in use with a Sirius satellite receiver and a ProClip Mounting Platform. 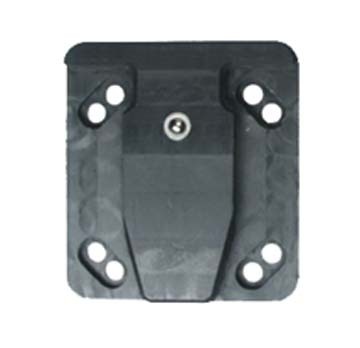 The Device Mounting Adapter accommodates the AMPS hole pattern in both landscape and portrait. The images show the Device Mounting Adapter in use with a Sirius Satelite Receiver and a ProClip Mounting Platform. 1. Place the male plate over the matching holes in the back of your device. (If you have any other mounting device attached this has to be removed first.) Screw the plate to the device using the enclosed screws. 2. Attach the female plate to the ProClip and screw it to the mount using the enclosed screws. 3. Slide the Device down into the female plate on the vehicle mount until it clicks into place. 4. The Device in place on the vehicle mount.